Paso offers ISE 2019 visitors an interactive and smart experience dedicated to technological innovation in evac audio systems. The proven know-how in “made in Italy” solutions for emergency broadcasting and voice evacuation is narrated at booth 7-R220 through many new features and meeting opportunities. We’ve “tested” them for you during the Happy Hour & Press Meeting on 6 February, a pleasant occasion to get in touch with the Paso’s CEO Antonio Faccioni and his staff, in order to deepen what was presented in Amsterdam. The well-known PAW family, which already included the PAW3502-V model and the PAW4500-VES range, expands with the PAW5000 range of compact systems, which includes two series: the PAW5500-VES range (models PAW5502-V, PAW5504-V, PAW5506-V / 500 W / 2-4-6 zones) and the PAW51K-VES range (models PAW51K4-V, PAW51K6-V / 1000 W / 4-6 zones). The new PAW5500-VES range includes three integrated voice evacuation systems for emergency systems (for two, four or six zones, rated at 500 W), specifically designed for wall mounting and equipped with a control unit certified according to EN 54-16: 2008 and EN 54-4 standards. These systems can manage two to six alarm zones, depending on the model, each with a dedicated amplifier, remote microphone stations and controlled inputs to be connected to a fire control unit. Up to six systems can be connected to each other (thus reaching a maximum coverage of 36 zones). 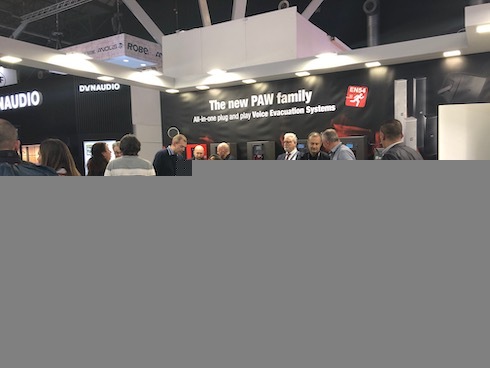 The PAW51K-VES range instead includes two new integrated voice evacuation systems for emergency systems (PAW51K4-V and PAW51K6-V) for four or six zones with a higher rated output, not 500 W but 1000 W.
The other big news that animates Paso’s ISE 2019 is called MIM1000—Music Internet Monitoring System, a new system dedicated to checking the state of Paso’s voice evacuation systems. MIM1000 allows the user to view directly on smartphone or tablet, via an App, all the most important information related to the system. The core component is the SOURCE1000 multi-source module: by connecting it via wi-fi to a multi-channel Paso system, it can be used to send music signals to different zones, making it ideal for applications such as large hotels, shopping centers and, in general, for all spaces where you need to remotely select different background music tracks. Also making up the system are MIM1000-ILan, a LAN interface module for controlling SOURCE1000 devices connected to PASO systems and for reading information about the audio system via App and ModBus, and MIM1000-IMod, for easy and fast system status reports. But there’s more! 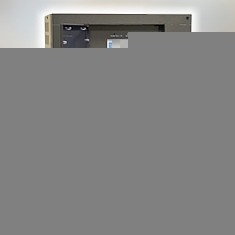 At ISE 2019, Paso also presents three new ranges of loudspeakers (C-1000EN, C-1000TW and C-6000EN), with IP55 protection (waterproof) and EN54-24 certification, available in different models and power levels, and equipped with optional accessories for wall mounting. The C6000-EN range comprises two column models: the C6120-EN and C6060-EN, with eight and four 3” full range woofers (respectively), 120 and 60 W of power, frequency response from 140 to 20,000 Hz, SPL 1W/1m 95 and 92 dB. The C1000-EN range (C1200-EN/C1100-EN/C1050-EN), certified EN54-24, is suitable for both sound reinforcement and voice alarm/evacuation functions. All enclosures are internally equipped with ceramic terminal blocks and thermal fuses, ensuring the continued operation of loudspeakers in the event of a fire, while all connections and cables adhere to the EN50200 standard. Frequency response from 68 to 20,000 Hz for the C1200-EN, SPL @1W/1m from 97.5 to 94 at 87.5 dB for the smallest (C1050-EN). C1000-TW, the range composed of three speakers for both outdoor and indoor use (C1200-TW, C1100-TW, C1050-TW) boasts similar performance to the C1000-EN range, but it is not EN54-24 certified and is thus destined for less involved applications. 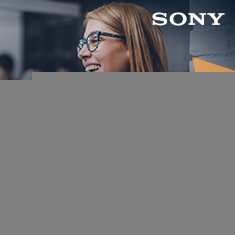 Finally, the three innovation areas are joined by a wide range of accessory boards/interfaces and the new 19″ racks.